Most of the adventures in this series took place on the sea or close to it, where George lived with her parents and Timmy. The four cousins – none of them older than sixteen, if I remember it right – could take a picnic hamper and row in a boat by themselves to the small island (called Kirrin Island, and owned by George’s father, incidentally) in the middle of the sea, which had the ruins of a castle on one side of it and the remains of a shipwreck on the other. They could camp away for days inside an old and abandoned lighthouse or pack themselves into a caravan and travel to the Mystery Moor, all without any adult supervision. Can you think of anything more adventurous and attractive for a ten-year-old reader? Blyton wrote numerous books and series targeted at toddlers all the way up to teens. After Famous Five, I barely skimmed through one series called Malory Towers. None of the other books she’d written were available in the libraries where I lived, so I never got much into any of the other ones written by her. Her books are readily available in the bigger book stores in India (and probably in various countries in Europe, too? I’m not too sure), but, sadly, not so in America. 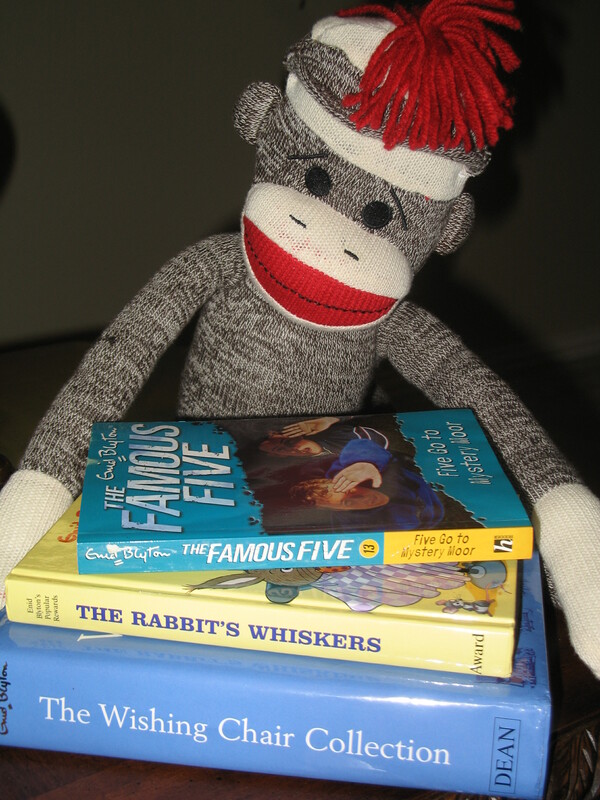 Very few have even heard of Blyton in the U.S. To the best of my knowledge, none of the bigger chains of book stores have her books on their shelves. You’d have to buy them online or borrow from those public libraries that carry them. It is with some reluctance, at this point, that I bring up one thing about Enid Blyton’s books. They are not politically correct, at least for this day and age – the narration sounds as if girls are supposed to behave a certain way and boys need to be given upper hand by default. For instance, as you read the books you can’t help but perceive that the prim-and-proper Anne’s actions are approved wholeheartedly, whereas tomboyish and headstrong George (christened Georgina, but shortened to George by the girl who hates being a girl) is tolerated with patronizing indulgence. However, given the time period that she wrote these books (1940s to 1960s), those were probably the sensibilities that were in vogue. As a child, I just took it in stride and never bothered about it much. Being a girl myself, my reasoning was simple: those were the author’s opinions about the subject. That didn’t necessarily mean that I had to agree with her. It didn’t take anything away from the books for me, so why fuss over it? If you’re an adult who hasn’t had a chance to read Enid Blyton, then snuggle up with one of her books today (under the pretext of reading to a child, if you’re shy about reading a children’s book for yourself). The child will love it anyway, but you may soon find yourself putty in the hands of a masterful storyteller, who makes the craft seem beguilingly simple. As time went by, many more authors came into my life and took me to a great many places and reinforced my love for the written word. However, Enid Blyton was not going anywhere – she had lodged herself securely into a niche inside my heart. If the book that I’m currently writing manages to induce the same strength of emotions, at least in one child, which Enid Blyton’s books did in me, then I’ll feel that I have earned the right to aspire to write for children. ** – Excerpts taken from an article in Fiction Circus. Check out The Enid Blyton Society that I found online a few weeks ago. It has charming illustrations for her first edition books and all the information you want about the author and her books. This is how my introduction to Enid Blyton came about, and I never looked back. Enid Blyton and I have shared many an adventure together in my childhood. Is she a friend of mine? She very well could have been, for all that I felt for her and experienced with her by my side. Enid Blyton can be considered probably the most prolific writer of children’s literature (she wrote over 600 children’s and juvenile books over her forty-year career), and she hails from England. I speak of her in present-tense, even though, regrettably, she passed away quite a few decades ago – in 1968, to be accurate. But authors like her never die – they live on in the hearts of generations of readers that come after them. My eyes, and those of my like-minded siblings, would automatically scan for Blyton among the rows of books whenever we came across a well-stocked bookshelf — a habit I retain to this day. I began to find excuses to visit the school library – a large, musty, cavernous hall with tall bookshelves teetering under the weight of books, which were neither well-organized nor well-kept – more often than was allowed. Soon it got to be where the tall, rail-thin librarian (who had hitherto had an unnerving habit of looking at kids disdainfully down her nose) became my chum. She got into the habit of hunting for Blyton’s books among the mildewed tomes arranged in the forgotten shelves in the far recesses of the library. And on my next visit to her, she would produce for me a moth-eaten, dog-eared copy (of one of Blyton’s books or others that were close to Enid Blyton’s books in genre and setting – I sadly forget the authors’ names now) that I had yet to read, with an air of a wizard conjuring up a rare gem — which was exactly what the book was for me. With each new book that I read, my love for reading strengthened, until it metamorphosed into a desire for writing. 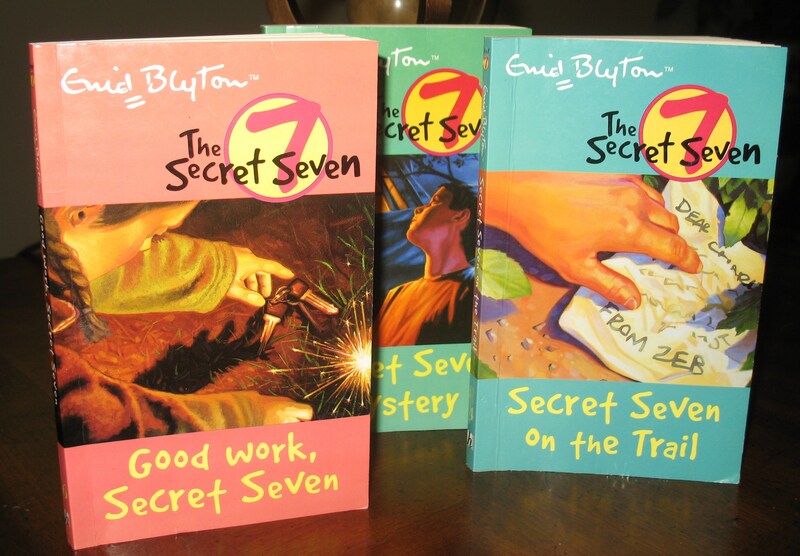 The Secret Seven series is set in a village in England where seven kids, obviously, found a secret society and solve crimes, big and small, in the neighborhood. There is also Scamper, the golden spaniel, who is always tail-waggingly ready to do his part in digging up clues. In all of Enid Blyton’s books food features prominently, and the characters are always either having smashing teas or settling down to tuck into the contents of laden picnic hampers. The books are sprinkled with references to eatables such as: currant buns, ginger biscuits, meat pies, boiled eggs, scones, lemonade, sausages, egg and lettuce sandwiches, ginger-beer and chocolate éclairs. For a child brought up on a steady diet of idli, chapati, dosa***, and chicken curry, among other things, those foodstuffs were as exotic and mouth-watering as they could get. As I read about: the foggy autumn morning with smoke spiraling lazily up the chimney of the shepherd’s cottage; or the children biking to school along narrow lanes bordered by celandines, violets and primroses; or the gardener dressed in a patched tweed coat and hat working in the vegetable plot in the back of Bramble Cottage on Hawthorne Lane, my heart would ache from nostalgia. Nostalgia? I was all of seven, for crying out loud, and all I’d experienced until then was only hot and humid tropical weather. What could I possibly be pining for? I have yet to figure that one out, but that was exactly how the books left me feeling. To me, Enid Blyton is, and always will be, a sorcerer who, with a wave of her magical fountain pen, created a cozy and charming world, populated it with simple, lovable characters and then softly breathed life into the both of them. ** Excerpt from “Secret Seven on the trail” by Enid Blyton. Just a note before I begin: I aim to keep these pages completely clean and kid-friendly. I would love it if you brought the children in your life to these pages once in a while — with you supervising them, of course, if they’re very young. Now would be a wonderful time to do so: starting today, I’m going to do the next few posts with the young (in-earthly-years or at-heart) as my target audience. Do I hear a “yes”, followed by muttering to the effect of “but only because I have to. Not because I like to”? I also heard some resounding “yeah”s to my question, which means that some of you are avid readers already. Good! Keep at it now. And persist even later, when distractions stare you in the face and try to take you away from this passion of yours. Let me tell you why you should keep on reading, whether you love it or loathe it. Think about this: when you find a book that you like, you have made a friend forever. And what a friend that book will turn out to be! Does not impose its personality on you. Listens to whatever you have to say to it. Never brings its problems to you. 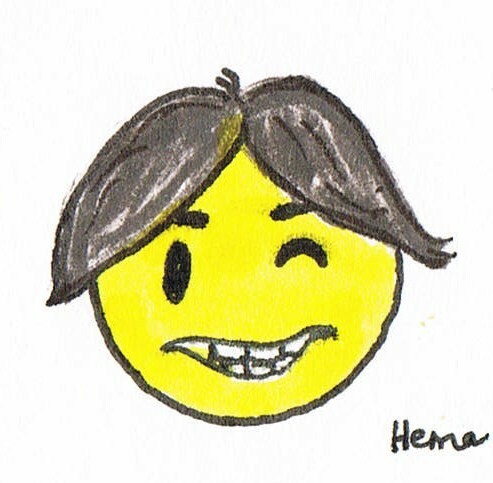 Is opinionated — make no mistake about that – but it does not shun you if you disagree with it. Does not label you “geeky”, “popular” or “nerdy”. This Hema P is such a dork! Just because I don't speak out loud, she assumes that I don't label her? Hmph! Makes no demands on your time. It sits there waiting for you patiently, so it can open up to you the minute you wish it to. Doesn’t need cleaning and feeding, just gentle handling. Will accompany you around the world without you even having to leave your house. Doesn’t pressure you into doing things that you don’t want to. Doesn’t need you to dress up to go meet with it. Lounging in pajamas is the best way to cozy up with your favorite book. Will wait for you, years on end at times, when you grow out of it and drift away. It will remain on your bookshelf waiting for you to come back, dust it and reclaim it as a friend. Aren’t these reasons enough for you to set out on a search for a good book? Did I overlook any more reasons? If yes, I’d love to learn which ones — if only so I could feel all the more blessed to have made so many good friends myself. Come visit me again and I’ll introduce you to a bunch of wonderful books and authors. And who knows? There may be one or two among them that you’d want to add to your bookshelf. P.S: Thank you so much, everyone, for your support in following Mark McVeigh!! I think I may have earned that chat with him, after all! What a coincidence! Right after I published today’s post, I went to Mark McVeigh’s new blog, as is a habit of mine everyday. Yes, you guessed it right — he is a literary agent. And what do I see? He’s asking his followers to get ten other people to follow his blog, and then he’ll give them (the original follower) a free phone chat! Mark has a great track record as an editor at several big publishing houses and has opened his own agency last year. As my friends, could you please go to: Mark McVeigh’s blog, become a follower and leave a comment, referring to my blog by name? If you are a writer yourself, you should check him out as a prospective agent for your manuscript! Go on now, why are you still loitering here? The words ‘literary agent’ can cause heart-racing excitement and at the same time induce a paralyzing dread in a writer’s heart. If you’d like to know more about the role a literary agent plays in a book’s (and hence, a writer’s) life, please visit: AgentQuery. This is, obviously, a humorous take on the lengths to which writers go in order to thoroughly research the agents that they want to pursue, when their manuscript is ready for representation. 10. You have learnt by heart the whole anthology of poems that she likes. 9. You know her childhood nickname. 8. You know her college GPA. 7. You keep intercepting the pizza delivery guy, so you could deliver the pizza to her office. 6. You have, at the tip of your tongue, a roster of all the conferences the agent is going to attend in the next few months, and the topics she’s going to be speaking at each of those. 5. You know what her middle initial stands for, when the only place it has ever been written out is the agent’s birth certificate. 4. You exactly know which pair of shoes she prefers to match to which of her outfits. 3. You name your newborn baby-boy after her. 2. You have an altar for her in your house. 1. You can write a factual biography of the agent without having to use her as a resource. Here are the first two installments: Whodunit -1 and Whodunit – 2. This three-part series has been my version of a shout-out to all my ‘sisters-in-crime’ – thank you, for having my back!! Southern Sisters Mysteries by Anne George: This author herself reminds me of Miss Marple. The humor in these books is sharp as a blade, and you never have a chance to recover from one farce before another is lobbed at you. The contrast (on all fronts — physical, emotional and behavioral) between the two sisters, Patricia Anne and Mary Alice, is just hilarious, and it lands them both in the funniest of pickles imaginable. I only wish that the author had lived longer to churn out some more of these gems – call me selfish! Rei Shimura Series by Sujata Massey: This is set in modern-day Japan (at least half of the series, after which the author moved the whole setting to America – go back to Japan, Rei!!). Rei is an antiques dealer who finds herself in the most bizarre (and sometimes compromising beyond belief, during which the author finds it necessary to give the reader lurid and intimate details that only act as needless distractions for me) situations and sets about solving the conundrums behind them. The author does a wonderful job of introducing the cities and towns of Japan and their customs in a seamless fashion, thus making the books very attractive to me. Ellie Quicke Mysteries by Veronica Heley: Taking place in a nondescript modern-day suburb of London, it features Ellie Quicke, a widow, who is coming into her own and finding her ‘self’ after being a wife and a mother forever. She lives in the coziest of houses, whose backyard borders the green on which her church is located. Throw in an insensitive daughter, a bossy aunt-by-marriage (who constantly reminds me of Miss Havisham in Dickens’ Great Expectations), demanding church co-patrons, and two fervent beaus and you have a winner. Watch out, though — this author can actually wring your heart with her direct, yet sensitive, treatment of some of the subjects (such as pedophilia and domestic violence) in these books. Benni Harper Mysteries by Earlene Fowler: Benni Harper and her husband, Police Chief Ortiz, enjoy one of my very favorite relationships in all the novels I read. It is so sweet, yet so complicated like any ‘real’ relationship. (I’m not much of a fan of those books that depict relationships as if they can thrive and coast along without any bumps. C’mon, how real is that? Which relationship ever gets to the point of complete complacency? Okay, I’ll get off my soapbox now.) Anyway, Benni is a horse-riding real, live cowgirl (and stubborn as a mule when it comes to solving crimes). And you can’t help but love her sassy 70-something grandma, Dove, who is like a tablespoon of nutmeg in eggnog. This series has an underlying theme of quilting and folk art, which I love reading about. Melanie Travis Mysteries by Laurien Berenson: This involves single-Mom Melanie Travis (at least for part of the series) and her travails in life. Because of her steamroller of an aunt, Peg, who is an authority in dog (standard poodles) breeding, Melanie and her son, Davie, find themselves owners of a poodle and busy dog show participants before long. As the titles of the books indicate, dog-show-world is where Melanie gets embroiled in mysteries, which she manages to unravel time and again. Even if you’re not up to the challenge of breeding and showing dogs yourself (or, especially in that case), you may just vicariously love to lose yourself in the fast-paced and muddling life of Melanie, like I did. Give it a try! Btw, Happy Valentine’s Day (Sunday), everyone!! I’m not much of a red roses and balloons person, so that’s all I’m going to say about the subject. Besides, who needs pink candy when one can have black coffee? 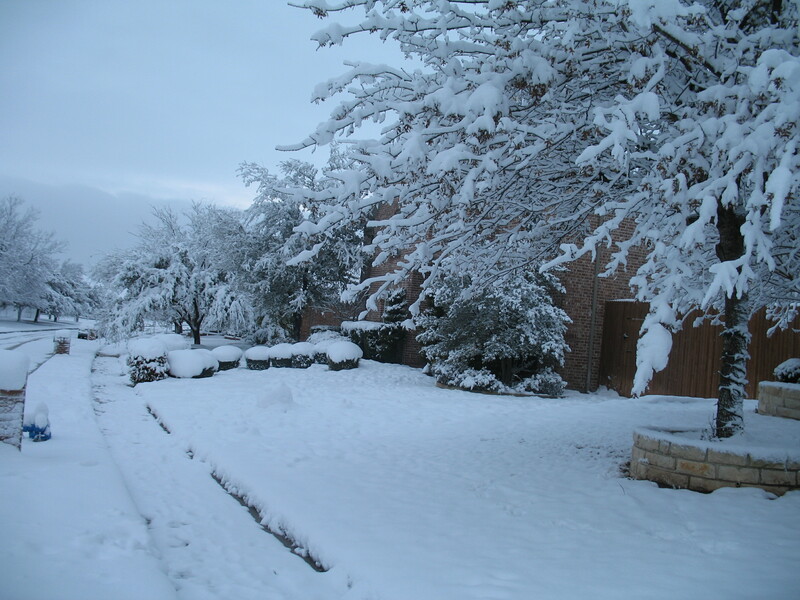 P.S: Where I live, it doesn’t usually snow. But it did all day yesterday and some into the night resulting in a 10 inch accumulation (the highest in the last 100 years). Standing at my window, I feel like C.S. Lewis’s Lucy about to step into Narnia.